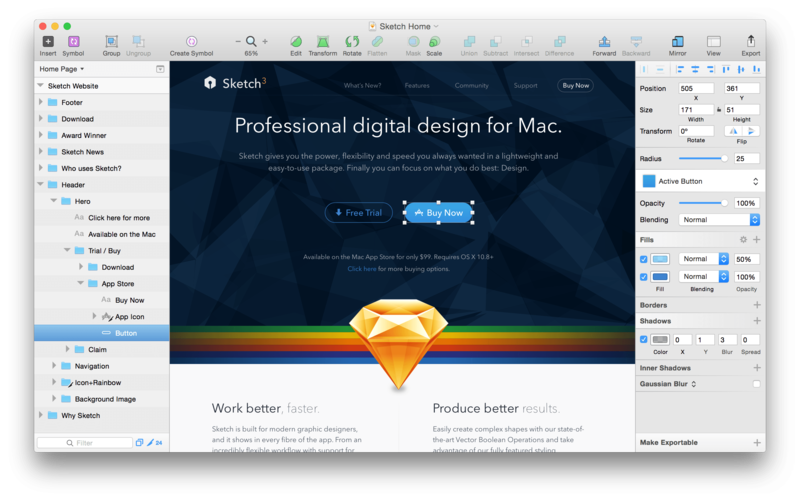 Today, Bohemian Coding, the maker of Sketch, a popular vector design program, announced a new licensing program that has some interesting parallels to the app subscription pricing announced several hours later by Apple. Instead of a paid-up-front model with paid upgrades limited to major releases, Sketch customers will pay an annual license fee to receive upgrades for a year, regardless of how big the updates are during that period. App Review continues to take at least a week, there are technical limitations imposed by the Mac App Store guidelines (sandboxing and so on) that limit some of the features we want to bring to Sketch, and upgrade pricing remains unavailable. Previously, Sketch was sold for an up-front fee of $99. Like many other developers, when Bohemian Coding launched a major update to Sketch, it was released as a paid upgrade for existing customers, but between major releases, updates and bug fixes were free. Under the new licensing scheme, paying $99 annually will entitle customers to one year of all upgrades at no additional charge. Bohemian Coding carefully avoids using the term ‘subscription’ to describe its licensing, presumably to avoid confusion with products like Adobe’s Creative Suite, which can no longer be used if a customer cancels their subscription. In contrast, Sketch will continue to work if your do not pay the annual fee, but updates will not be available. Looking back at the reasons that Sketch left the Mac App Store, I can’t help but wonder whether Sketch may come back to the store someday, which is exactly what Federico and Stephen Hackett speculated about during episode 94 of Connected. After all, review times are substantially improved and the new subscription model announced seems to be designed to achieve many of the same things that Sketch’s new pricing model is intended to accomplish. 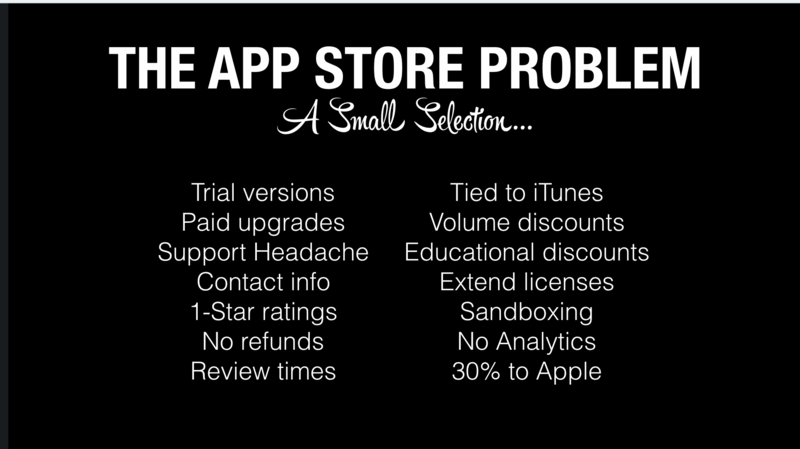 Slide listing App Store issues discussed by Pieter Omvlee at Release Notes. But having attended Pieter Omvlee’s talk1 at the Release Notes conference last Fall, I’m not sure the changes made so far are sufficient to bring Bohemian Coding back to the Mac App Store. Sandboxing and the lack of a direct connection with customers were among the many factors that resulted in Sketch being pulled from the Mac App Store. There are also major questions that remain unanswered by Apple, like which kinds apps will be able to implement subscriptions. Regardless of how Apple’s announcements today impact Sketch, it will be fascinating to watch Bohemian Coding and other app developers use subscriptions and other pricing tactics to adapt to the economics of the modern app economy.